Verification of the performance of the sanitation procedure is as important as the actual application. The methods that are going to be used for such verification needs to be user friendly and rapid resulting to apply the corrective actions promptly. Additionally, these methods should also be reliable besides their fast resulting. ATP bioluminescence method is recommended to be a solution for such procedures for many years. In this present study, our aim was to evaluate the performance of ATP bioluminescence method by comparison with golden standard classical cultural method. For this we performed parallel testing on surfaces which were experimentally contaminated with different types of microorganisms. The results showed that ATP bioluminescence gives more reliable results in surfaces which do not have any physical dirt and are contaminated with high level of microorganisms. The most reliable results were obtained from Salmonella contaminated surfaces. Ayçiçek, H., Oğuz, U., Karcı, K. (2006). Comparison of results of ATP bioluminescence and traditional hygiene swabbing methods for the determination of surface cleanliness at a hospital kitchen. International Journal of Hygiene and Environmental Health, 209(2), 203-206. Aytaç, S.A., Mercanoğlu, B., Özbaş, Y. (2001): Enumeration of Escherichia Coli 0157:H7 By Using Immunomagnetic Separation and ATP Bioluminescence In Buffer Solution. Turkish Hygiene and Experimental Biology Journal, 58(2), 49-52. Boyce, J.M., Havill, N.L., Dumigan, D.G., Golebiewski, M., Balogun, O., Rizvani, R. (2009). Monitoring The Effectiveness Of Hospital Cleaning Practices By Use Of An Adenosine Triphosphate Bioluminescense Assay. Infection Control and Hospital Epidemiology, 30(7), 678-684. BRC (2014). Global Standard for Food Safety. Issue 7. British Retail Consortium, UK. Carroscosa, C., Saavedra, P., Millán, R., Jaber, J. R., Pérez, E., Grau, R., Raposa, A., Mauricio, C., Sanjuan, A. (2012). Monitoring of cleanliness and disinfection in dairies: Comparison of traditional microbiological and ATP bioluminescence methods. Food Control, 28, 368-373. Chen F.C., Godwin, S.L, (2006). Comparison of a Rapid ATP Bioluminescence Assay and Standard Plate Count Methods for Assessing Microbial Contamination of Consumers Refrigerators. 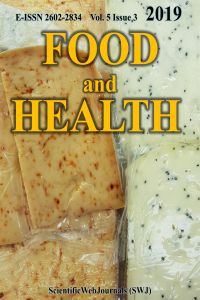 Journal of Food Protection, 69(10), 2534-2538. Chollet, R., Kukuczka, M., Halter, N., Romieux, M., Marc, H.M., Benguin, V., Raibault, S. (2008). Rapid Detection and Enumeration of Contaminants by ATP Bioluminescense Using the Milliflex Rapid Microbiology Detection and Enumeration System. Journal of Rapid Methods and Automation in Microbiology, 16, 256-272. Chu, C.P., Lee, D. J., Chang, B.V., Liao, C. S. (2001). Using ATP Bioluminescence Technique for Monitoring Microbial Activity in Sludge. Biotechnology and Bioengineering, 75(4), 469-474. Corbit, A.J., Bennion, N., Forsythe, S.J. (2000). Adenylate kinase amplification of ATP bioluminescence for hygiene monitoring in the food and beverage industry. Letters in Applied Microbiology, 30(6), 443-447. Costa, P.D., Andrade, N.J., Brandao, S.C.C., Passos, F.J.V., Soares, N.F.F. (2006). ATP-Bioluminescence Assay as an Alternative for Hygiene-Monitoring Procedures of Stainless Steel Milk Contact Surfaces. Brazilian Journal of Microbiology, 37, 345-349. Cutter. C.N., Dorsa, W.J., Siragusa, G.R. (1996). A rapid microbial ATP bioluminescence assay for meat carcasses. Dairy Food Environment, 66, 726-736. Davidson, C.A., Griffith, C.J., Peters, A.C., Fielding, L.M. (1999). Evaluation of two methods for monitoring surface cleanliness - ATP bioluminescence and traditional hygiene swabbing. Luminescence, 14(1), 33-38. Griffith, C.J., Davidson, C.A., Peters, A.C., Fielding, L.M. (1997). Towards a strategic cleaning assessment programme: hygiene monitoring and ATP luminometry, an options appraisal, Food Science and Technology, 11, 15-24. Griffith, C.J., Cooper, R.A., Gilmore, J., Davies, C., Lewis, M. (2000): An evaluation of hospital cleaning regimes and standards. Journal of Hospital Infection, 45, 19-28. ISO (2001). Microbiology of food and animal feeding stuffs-Horizontal method for the enumeration of beta-glucuronidase-positive E. coli. Part 2: Colony-count technique at 44 degrees C using 5-bromo-4-chloro-3-indolyl beta-D-glucuronide, 16649. International Standard Organisation, Geneva, Switzerland. ISO (2004). Microbiology of food and animal feeding stuffs-Horizontal methods for sampling techniques from surfaces using contact plates and swabs, ISO 18593. International Standard Organisation, Geneva, Switzerland. ISO (2009). Prerequisite programmes on food safety. Part 1: Food manufacturing, ISO 22002-1. International Standard Organisation, Geneva, Switzerland. Jasson, V., Jacxsens, L., Luning, P., Rajkovic, A., Uytendaele, M. (2010). Alternative microbial methods: An overview and selection criteria. Food Microbiology, 27, 710-730. Larson, L. E., Ailello, A.E., Gomez-Duarte, C., Lin, S.X., Lee, L., Della-Latta, P., Lindhardt, C. (2003). Bioluminescense ATP Monitoring as a Surrogate Marker for Microbial Load on Hands and Surfaces in the Home. Food Microbiology, 20, 735-739. Lehto, M., Kuisma, R., Määttä, J., Kymäläinen, H.R., Mäki, M. (2011). Hygienic level and surface contamination in fresh-cut vegetable production plants. Food Control, 22, 469-475. Leon, M.B., Albrecht, J.A. (2007). Comparison of adenosine triphosphate (ATP) bioluminescence and aerobic plate counts (APC) on plastic cutting boards. Journal of Food Service, 18, 145-152. Moore, G., Griffith, C. (2002). A comparison of surface sampling methods for detecting coliforms on food contact surfaces. Food Microbiology, 19, 65-73. Moore, G., Smyth, D., Singleton, J., Wilson, P. (2010). The Use of Adenosine Triphosphate Bioluminescense to Assess the Efficacy of a Modified Cleaning Program Implemented Within an Intensive Care Setting. American Journal of Infection Control, (London) 38, 617-622. Rosmini, M.R., Signorini, M.L., Schneider, R., Bonazza, J.C., (2004). Evaluation of two alternative techniques for counting mesophilic aerobic bacteria in raw milk. Food Control, 15, 39-44. Sala, C., Milovan, G.H., Morar, A., Nıichita, I. (2008). Establishing the Microbial Contamination of Surtaces from the Food Industry by Alternative Methods Using ATP Bioluminescense. Lucrărı Stiinłifice Medicină Veterinară, 41, 841-846. Siragusa, G.R., Cutter, C.N., Dorsa, W.J., Koohmaraie, M. (1995). Use of a Rapid Microbial ATP Bioluminescence Assay to Detect Contamination on Beef and Pork Carcasses. Journal of Food Protection, 58(7), 770-775. Sokolinkska, C.D. and Pikul, J. (2008). Evalution of Steel Surface Cleanliness Level in Dairies Using the Bioluminescense Method. Bulletin of the Veterinary Institute in Pulawy, 52, 625-629. TSE (2006). Food Safety management systems. TS EN ISO 22000. Turkish Standard Institute, Ankara. Valat, C., Champiat, D., N’Guyen, T.T.T., Loiseau, G., Raimbault, M., Montet, D. (2003). Use of ATP bioluminescense to determine the bacterial sensitivity threshold to a bacteriocin. Luminescense, 18, 254-258. Vilar, M.J., Rodríguez-Otero, J. L., Diéguez, F.J., Sanjuán, M.L., Yus, E. (2008). Application of ATP bioluminescence for evaluation of surface cleanliness of milking equipment. International Journal of Food Microbiology, 125 (3), 357-361. Whitehead, K.A., Smith, L., Verran, J. (2008). The detection of food soils and cells on stainless steel using industrial methods: UV illumination and ATP bioluminescence. International Journal of Food Microbiology, 127, 121-128.